Imagine being a woman, dressed as a man fighting in the Civil War. 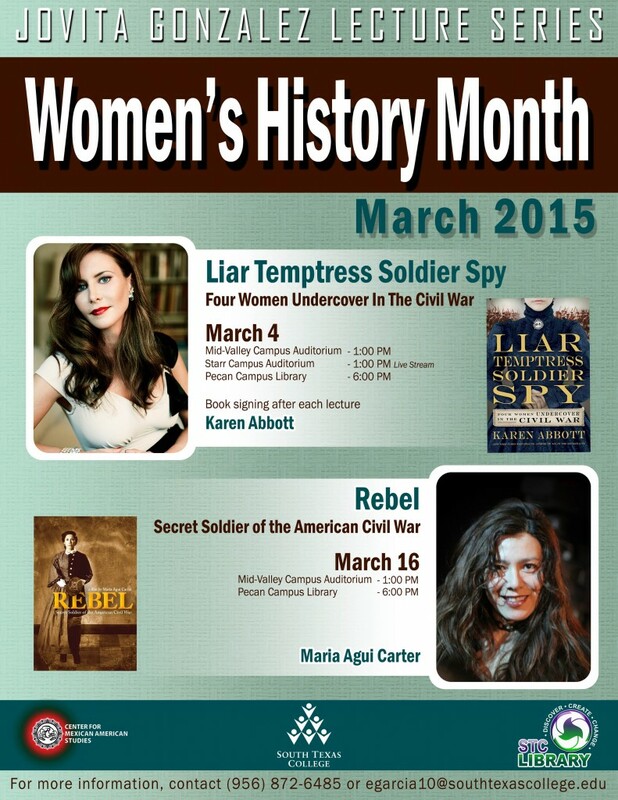 This March 4th during Women’s History Month, you will be able to get insight into four women’s lives during the American Civil War when New York Times bestselling author Karen Abbott visits the South Texas College Libraries. During her visit, Abbott will explore the spellbinding true stories of four very different women – a socialite, a farm girl, an abolitionist, and a widow – who took on the responsibility of soldiers and spies. 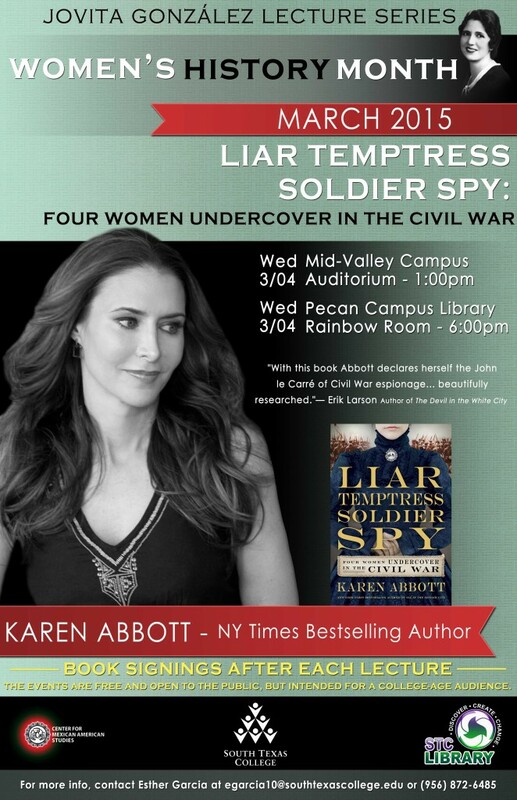 Her book Liar, Temptress, Soldier, Spy: Four Women Undercover in the Civil War has received many accolades with many noting Abbott’s pulse-quickening narrative as well as praise for her wealth of primary source materials. It has been named a best book of 2014 by Library Journal, the Christian Science Monitor, Amazon, and Flavorwire, and has been optioned by SONY for a miniseries. Abbott will visit two of South Texas College’s campuses on March 4th. 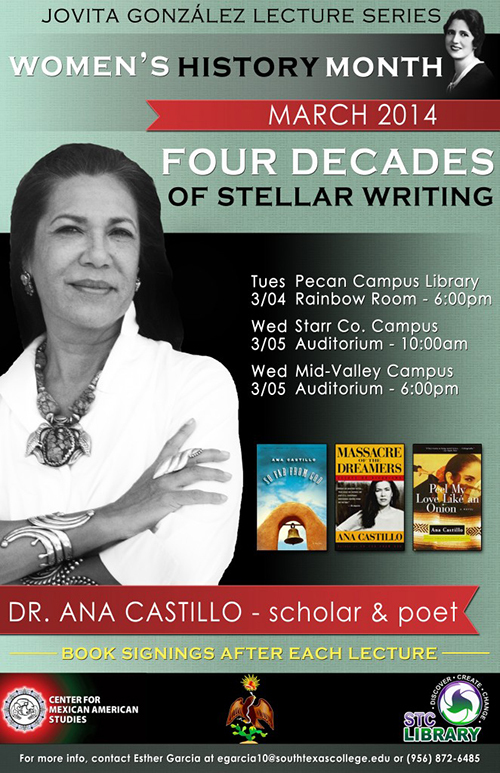 At 1:00 pm, Abbott will visit the MidValley Campus Auditorium, and at 6:00 pm, she will visit the Pecan Campus Library. Following her discussion, there will be an opportunity to purchase the book and have the author sign it. Abbott’s previous books include Sin in the Second City and American Rose which were both New York Times Best sellers. She is a featured contributor to Smithsonian Magazine and also writes for the New York Times series about the Civil War. A native of Philadelphia, where she worked as a journalist, she now lives in New York City where she is at work on her next book. 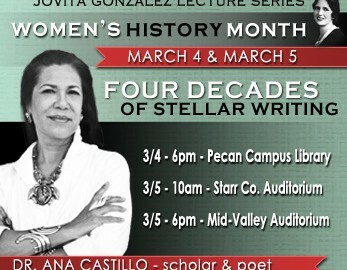 Abbott’s visit coincides with the South Texas College Library’s commemoration of Women’s History Month. Other events throughout the month will include lectures, movies, and book displays. On April 2nd Laura Varela, filmmaker, media artist, activist and educator will be a guest speaker at South Texas College, Starr County Campus. Laura Varela is a San Antonio-based documentary filmmaker and media artist whose work as a storyteller is shaped by her roots growing up on the US/ Mexico Border in El Paso, Texas. Her work navigates between ideological, cultural, linguistic and physical borders through the use of film and contemporary art installations. She will speak about her upcoming projects and her experience with her film As Long as I Remember at 1 pm at the campus auditorium, located at 142 N FM 3167 Rio Grande City, Texas. The event which includes reception afterwards is free and open to the public. As Long As I Remember: American Veteranos examines the steep personal toll and enduring legacy of the Vietnam War on three artists from south Texas: visual artist Juan Farias, author Michael Rodriguez and actor/poet Eduardo Garza. Through the personal histories and experiences of these Chicano veterans, the film examines the role art plays in the sorting of memories, post-traumatic stress disorder (PTSD), activism and the conflict in Iraq. For more information about the event contact Terri Rosalez at 956-488-5822 or mtrosalez@southtexascollege.edu. Celebrate Women’s History Month with these great speakers! Throughout the month of March, South Texas College is celebrating Women’s History Month with activities focused on the extraordinary accomplishments of empowered women. Festivities include lectures, movies, an art exhibit and much more. Admission to each event is free and open to the public. 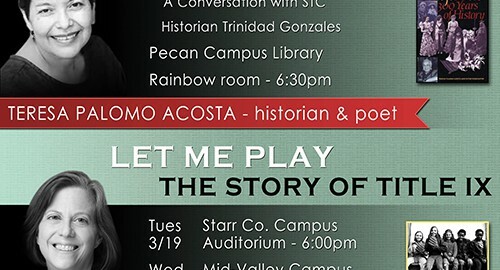 The college’s Center for Mexican American Studies will open the festivities with the Jovita Gonzalez Women’s History Month Lecture Series, which is kicked off by historian Teresa Palomo Acosta who will discuss “Las Tejanas: 300 Years of History” along with STC historian Dr. Trinidad Gonzales. This event will take place on March 6 at the Pecan Campus Library at 6:30 p.m. The talk will be followed by a book signing. 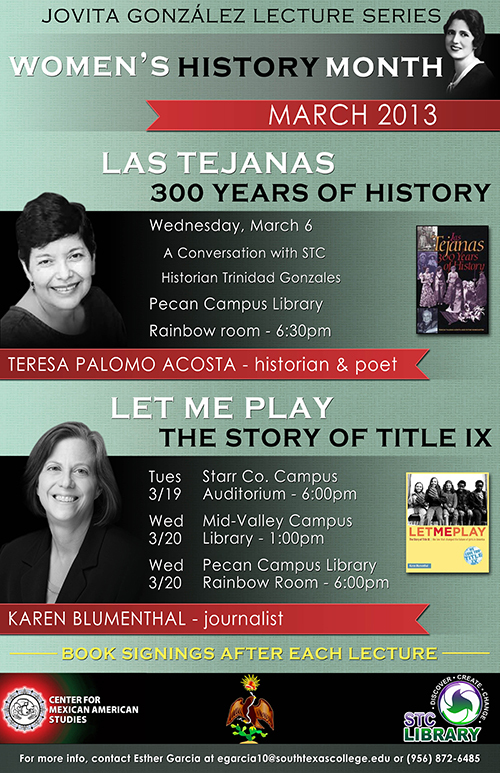 Following that talk, there will be a visit from journalist Karen Blumenthal who will discuss her book “Let Me Play: The Story of Title IX.” She will speak on March 19 at 6:00 p.m. at the Starr Campus Auditorium. 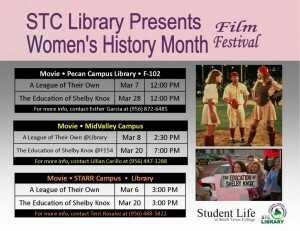 The following day then MidValley Campus Library on March 20 at 1:00 p.m., and she will conclude her visit at Pecan Campus Library on March 20 at 6:00 p.m.
At the MidValley Library there will be a screening of the film “One Woman One Vote” on March 19 at 2:30 p.m. followed by a panel discussion of the issues by the History Club. 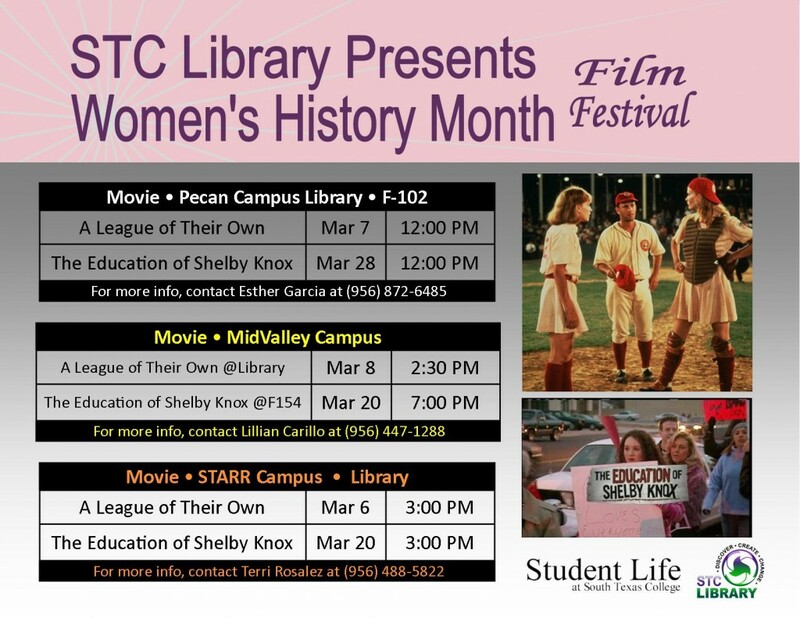 The Pecan Campus Library will host a screening of the film “Adelante Mujeres!” followed by a panel discussion of the Pecan Latin@s Club on March 26 at 12:00 p.m. The Starr Campus Library will be showing the acclaimed film “Iron Jawed Angels” on March 27 at 12:00 p.m.
On March 21 at MidValley, there will be a Reader’s Theater Night at 5:00 p.m., where faculty, staff, students and members of the community are invited to read a literature selection by or about a woman. 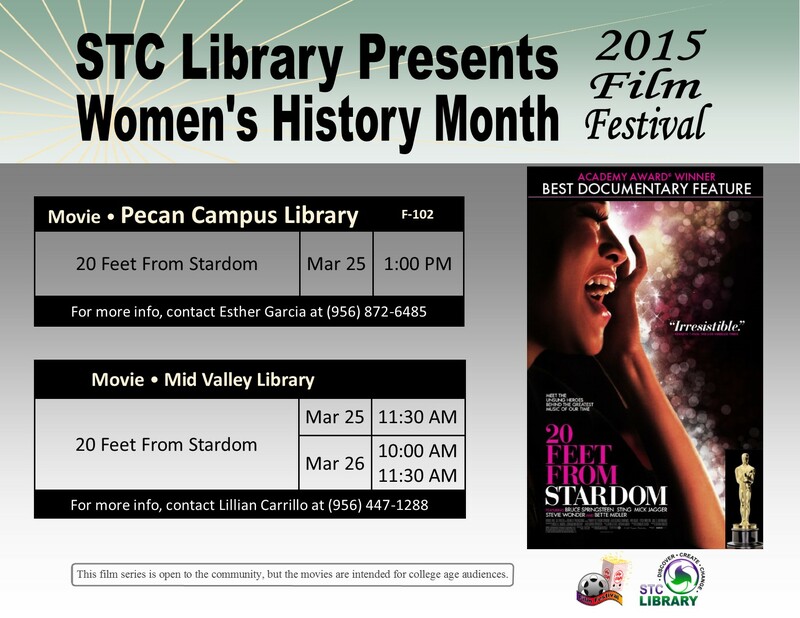 Throughout the month of March, the STC Library will exhibit a series of photos that show the story of “Mexican American Women.” The series of photos is from the National Women’s History Project, and it has been a collaborative effort between the Pecan Latin@s Club and the Library. Historian Julia Camacho will wrap up the Jovita Gonzalez Lecture Series with her talk “Mujeres Chineras: The Tanspacific Journeys of Mexican Women and Chinese Mexican Families 1910-1960.” On Thursday, March 22 Dr. Camacho will lecture at STC’s Mid-Valley Campus Building G Auditorium at 1 p.m. and at the Pecan Campus Library Rainbow Room at 6 p.m.
For more information about the Jovita Gonzalez Lecture Series contact Victor Gomez at 956-872-2070. For more information about the Center for Mexican American Studies visit the website at http://lass.southtexascollege.edu/hist_phil/mas/index.html. 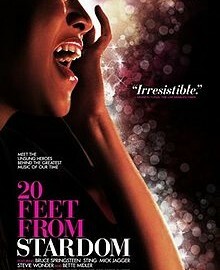 Celebrate Women’s History Month by catching one of these great movies at your campus! 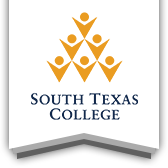 Throughout the month of March South Texas College is celebrating Women’s History Month with activities focused on the extraordinary accomplishment of women. Festivities include lectures, movies, an art exhibt, and much more. Admission to each event is free and open to the public. 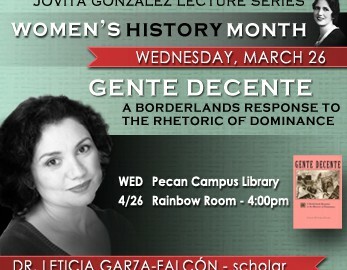 The college’s Center for Mexican American Studies and Department of Library Services will open the festivities with the Jovita Gonzalez Women’s History Month Lecture Series in its second year. 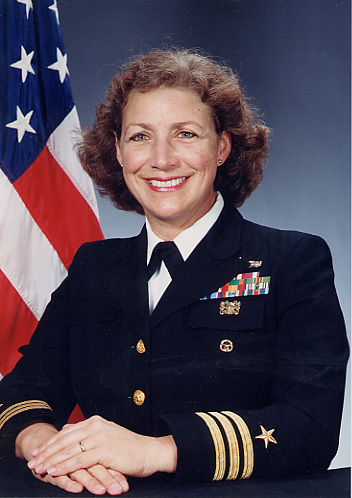 Retired Navy Commander Darlene Iskra will form part of the festivities. 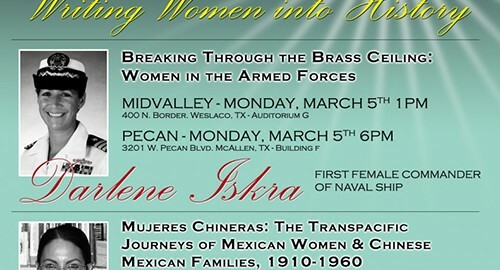 On Monday March 5 Dr. Iskra will be at the MidValley campus auditorium at 1:00 pm and at the Pecan campus library 6:00 pm. Her talk “Breaking Through the Brass Ceiling” focuses on the role women have had in the armed forces including the strategies women have used to move to the top in a masculine world. 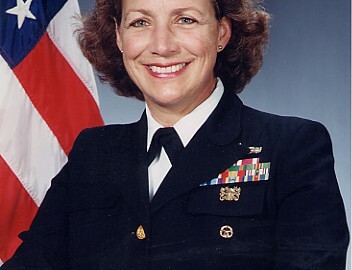 Dr. Iskra was the first female commander of a naval ship. 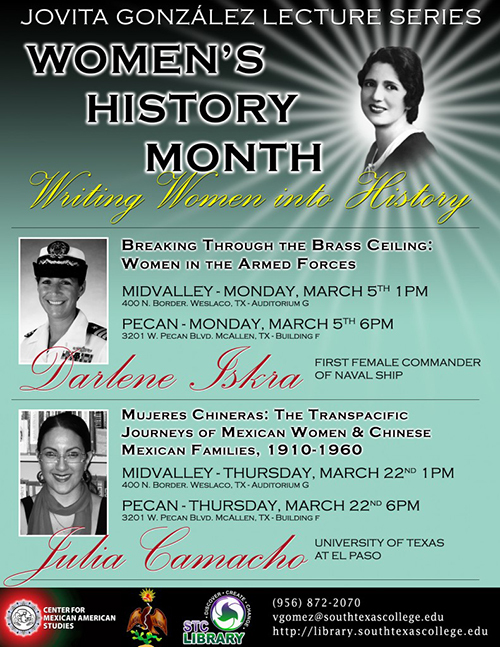 Historian Julia Camacho will wrap up the Jovita Gonzalez Lecture Series with her talk entitled “Mujeres Chineras: The Tanspacific Journeys of Mexican Women and Chinese Mexican Families 1910-1960.” On Thursday March 22 Dr. Camacho will visit the MidValley campus auditorium at 1:00 pm and at the Pecan campus library 6:00 pm. 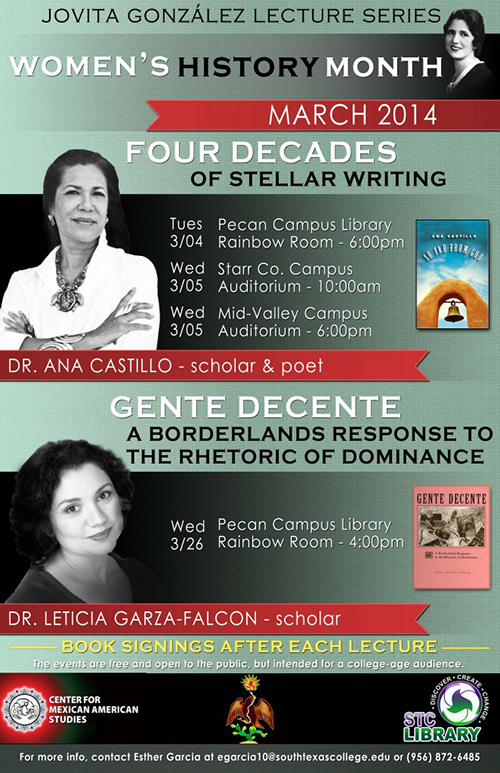 For more information about the Jovita Gonzalez Lecture Series contact Victor Gomez at (956) 872-2070 or email vgomez@southtexascollege.edu.